Halloween invitation maker from Smilebox lets you surprise friends with a great takeaway. Online Halloween invitation maker can be your little secret when it comes to creating fantastic holiday cards and party invites. 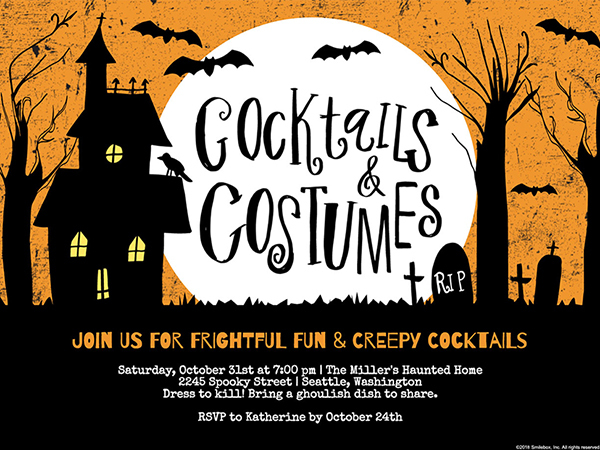 Friends will wonder how you had the time to make such amazing online Halloween invitations. Plus, when you use our online Halloween invitation maker, you’ll have more of a chance to get ready for the day. Free Halloween invitation maker gives you something different to hand out when you hear a knock on the door this fall. In addition to some tasty candy, you can include a fun card made with our free Halloween invitation maker. Printing at home is a snap with the online Halloween invitation maker.Any ghouls and goblins that can’t visit you in person can also receive your online Halloween invitation. It’s a matter of just a few clicks when using the free Halloween invitation maker to share your creation with friends and family by email and social media, no matter what neighborhood they are haunting. Have no fear when using the Halloween invitation maker – it’s downright easy. Smilebox has loads of free Halloween invitation maker templates to sample. Scroll down the page, find the scariest one, and then click “Personalize” to customize it. Pick some photos from last year’s holiday, or take some of your kids trying on their costumes, and see how they look on the Halloween invitation maker template. All you need to do is click “Add More Photos” and you’ll get access to all the images in your social media account, computer, and phone. Use the free Halloween invitation maker to type in the details of your Halloween party or holiday greetings. To make your online Halloween invitations even scarier, you can change colors and add music. Every time you make a change, you will see it immediately in the free Halloween invitation maker. Have a look to see if your online Halloween invitation is sufficiently creepy, finalize it, and then share it with friends and family. If you are using it for a party notice, you can email it to everyone on your list, or post it to social media. Using the free Halloween invitation maker from Smilebox is more than just easy – it’s also wise. Instead of searching for holiday photos taken last year, you can just look up the online Halloween invitation that you created. Over time, this will grow into a collection that reminds everyone of all the fun they had, and of how they looked every year on Halloween. Moreover, as your kids grow, they can become part of using the online Halloween invitation maker. Because it’s so easy to understand, you can sit with them as they choose the picture for the yearly online Halloween invitation and help you personalize the text. Online Halloween invitation maker is a great way to share the holiday with friends and family anywhere. An online Halloween invitation says more with a personalized message and professionally created background. Don’t forget that, when you use our free Halloween invitation maker, changes are super simple. So, if you want to make a different online Halloween invitation for various relatives, it only requires a few minutes. Sharing the online Halloween invitation is a piece of cake. You can email, post to social media, and print your creation with ease, so that you can send your online Halloween invitation to each person using the method that they prefer.